The Slovenian government has reopened its embassy in the Iranian capital after nearly four years of closure. 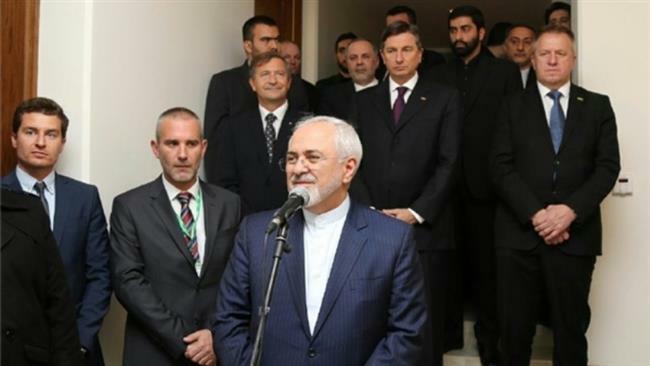 Slovenian President Borut Pahor, Iranian Foreign Minister Mohammad Javad Zarif and his Slovenian counterpart, Karl Erjavec, attended a ceremony for the reopening of the embassy in Tehran on Wednesday. Speaking during the ceremony, Zarif said the reopening of the Slovenian embassy would set a good trend towards the promotion of relations between the two countries. “There are good and suitable grounds for bilateral cooperation, which… we can advance [to a level] beneficial to the regional nations,” Zarif said. Pahor, for his part, said the reopening of his country’s embassy in Tehran bears testimony to good cooperation between the two countries. “We want to create common interests between our nations, and we believe that today is a very significant and promising moment for both countries and highly important for the development of Slovenia’s diplomatic activities,” he said. Slovenia’s embassy in Tehran was closed in March 2013 as part of the European country’s general austerity policies. Slovenia said at the time that the move came in response to the difficult financial and economic situation in the country. The reopening of the embassy had been announced by Darja Bavdaž Kuret, the state secretary at Slovenia’s Foreign Ministry, during a visit to Tehran earlier this month. Heading a high-ranking politico-economic delegation, the Slovenian president arrived in Tehran on Monday to hold talks with senior Iranian officials. 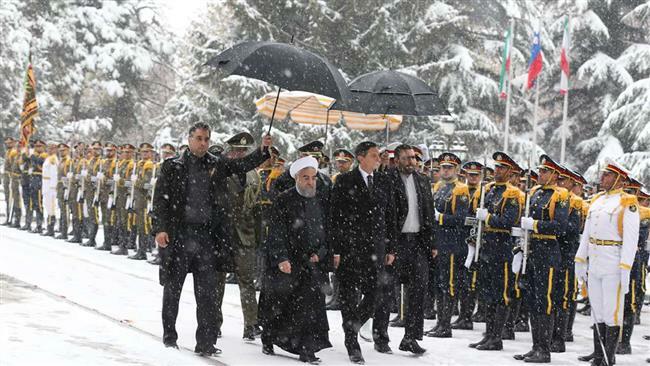 A handout picture provided by IRNA on November 22, 2016 shows Iranian President Hassan Rouhani (C-L) reviewing the honor guard alongside his Slovenian counterpart, Borut Pahor (C-R), during a welcoming ceremony at the presidential palace in Tehran. On Tuesday, Iranian President Hassan Rouhani met and held talks with his Slovenian counterpart. Rouhani said Pahor’s visit, the first by a Slovenian head of state in 25 years, and the reopening of the Slovenian embassy in Tehran indicated the two countries’ “strong resolve” to develop bilateral ties. Later on Tuesday, the Slovenian president was also received by Leader of the Islamic Revolution Ayatollah Seyyed Ali Khamenei. During the meeting, Ayatollah Khamenei said that Iran and Slovenia enjoyed great potentialities and capacities to bolster cooperation and expressed hope that the future would back up the Tuesday talks.